The New England Aquarium is located on Boston Harbor’s Central Wharf. 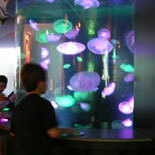 Established in 1969, the aquarium enlightens and entertains 1.3 million visitors each year. The aquatic facility has more than 70 exhibits that house marine life from around the world. The 23-foot-tall, 200,000-gallon Giant Ocean Tank simulates the habitat of a Caribbean coral reef. Marine life in the 40-foot-wide tank includes reef fish, barracudas, moray eels, stingrays, sea turtles and sharks. A fascinating exhibit depicts the habitat of various penguins, such as the African rockhoppers, which are named for their agility. Endemic to Australia and New Zealand, the little blue penguins rarely weigh over 3 pounds. Galleries dispersed throughout the aquarium highlight aquatic animals that inhabit marine ecosystems throughout the North and South American continents. The aquarium has presented several special exhibits dedicated to penguins, turtles, sharks and rays. Current displays feature fish and mammals that inhabit tropical, temperate and arctic waters of the Atlantic and Pacific oceans. The aquarium’s matriarch is a green sea turtle that has lived at the facility since 1970. Visitors can see green anacondas, leafy seadragons, bonnethead sharks and American lobsters. Giant Pacific octopus can move over 700 pounds with their powerful tentacles, and mesmerizing moon jellies exist without hearts, brains or bones. Guests of all ages can touch sharks, hermit crabs, sea urchins and sea stars. A popular activity during the warmer months is cruises to a nearby marine sanctuary that serves as a feeding ground for dolphins and various species of whales.